The green beans came up great! So did the purslane. Thankfully, I’ve been able to easily hoe it out since the soil is so crumbly and nice. Thousands, if not millions, of pigweeds came up to replace them. So, today, I ran the hoe through it again. Rob will till soon, but until then, I want to get the worst of it out of there before the weeds get big. None of that matters. 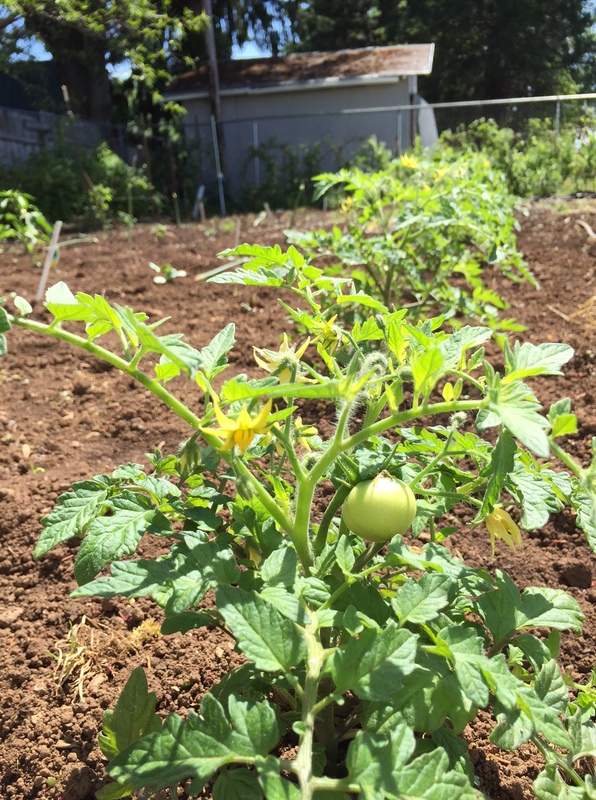 I have a tiny little green tomato. Really! I was amazed and shocked when I came back from camping and there it was! I have work to do, but there’s nothing new about that in a garden. 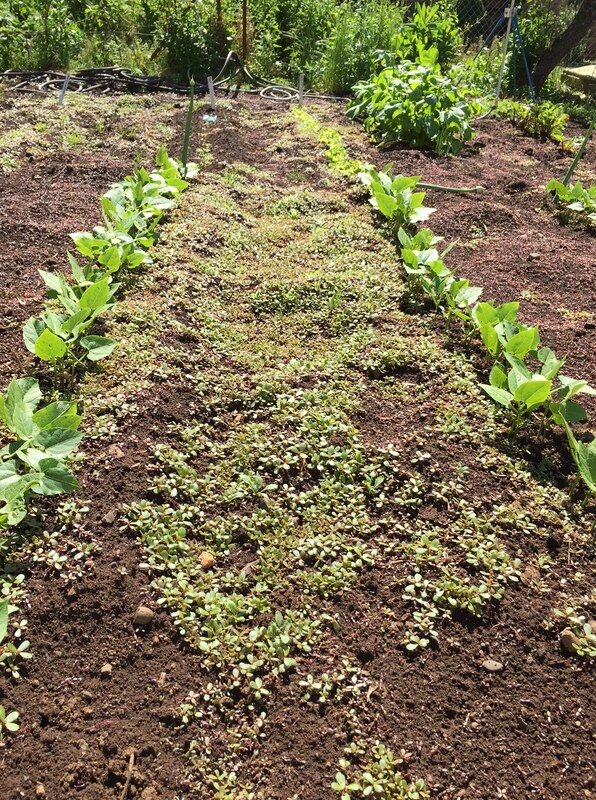 There is lettuce to pick, and snow peas forming. 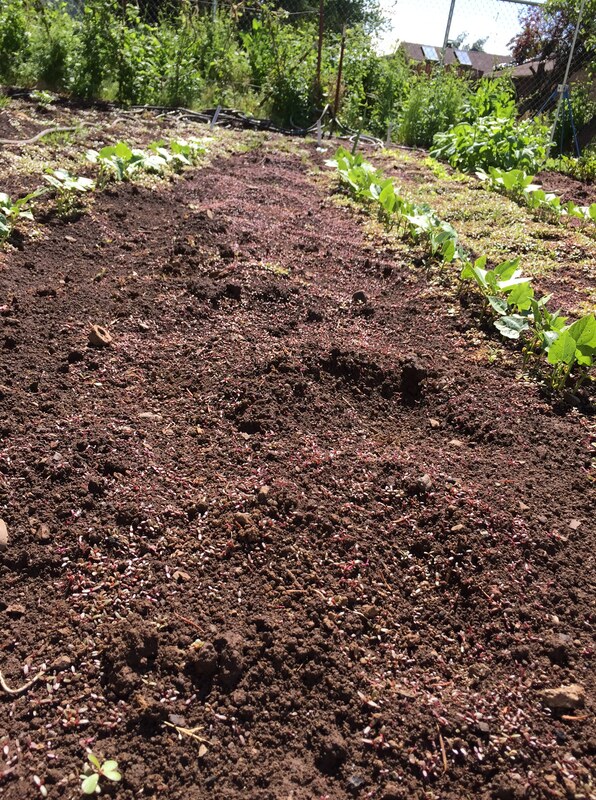 The radishes are bolting, as is the boc choi. I have a lot of weeds to hoe out and pull. It’s shaping up to be a great garden! A gardening friend of mine calls tomatoes ‘exotics’. We keep planting them each year without ever knowing if we’ll get a crop! Guess you’ll have a crop this year!! Too bad about your cabbage. Will you save the seed? I had a disappointment with my radishes. I was able to finally pick two big bunches. When picking I saw some had split!! You know how it goes – one day you leave them for a bit more and the next day they’re split. Also most had wormmie tunnels to cut out. So disappointed but so it goes in the garden, you’re right. I won’t save the seeds. I bought the plants and have no idea if they are hybrid or not. 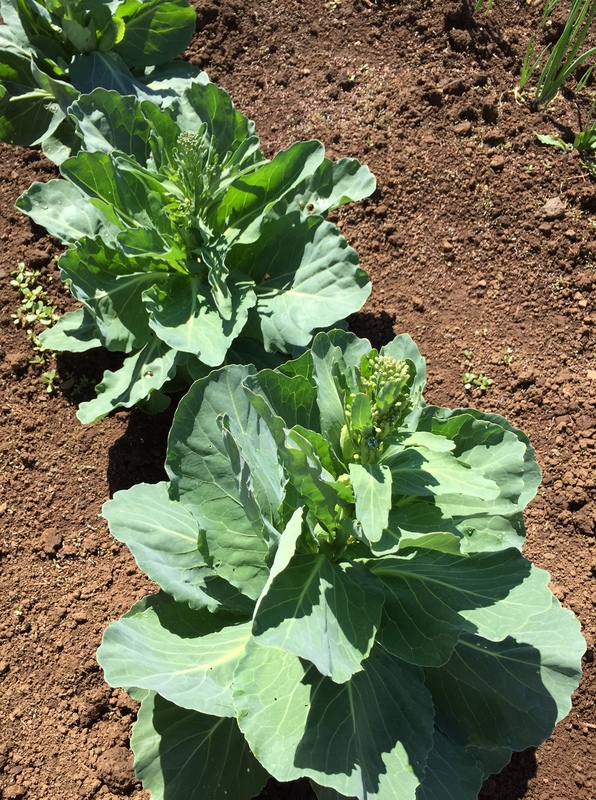 I’ll just yank them up and plant some more, or go buy a cabbage:) There may not be any available until late summer–I’ll see. One more thing–I read somewhere to put coffee grounds on carrots to help with the little root worms. I think it helped somewhat–not perfect, but better. I wonder if it would work on radishes? No idea, but might be worth an experiment! I get them free from Starbucks or McDonald’s. Hadn’t heard that about coffee grinds. I save my coffee grinds during the summer for ant control but will try it for the radish. Thanks! The starbucks here put their filters in with the coffee grinds – the few times I got some from them it was more trouble then it was worth. Glad your stores just give you the grinds! Wow, too bad about the cabbage! Will your husband be off this summer? Or help with summer school? I am looking forward to getting into the garden. 7 days left for me! He will be off for the summer. We have quite a few things planned, and he will pick up a few hours as a personal support worker. We are both certified for that program, and while I do it year round right now, he only picks up a few hours on weekends, etc. Because both my niece and nephew need PSW’s, there are times when they each might need some help. Since I can only be helping one at a time, he can help the other one. For instance, we plan to take them both to the zoo one day soon. Then, there are no worries as to someone going into the bathroom unaccompanied, etc. Of course, Patsy will join us–that’s the beauty of it all. I’m glad your summer is coming so soon–Rob still has until June 16th, and I am still homeschooling away–we just didn’t finish, yet. Close, though! Sorry about your cabbages! The weather seems to have gone nuts everywhere. I am watching daily for the first sign of tomatoes but mine have not been in long. Our new to us thrift store find coffee maker puts the used grounds into a container in the bottom of the unit and I can just take them out and dump them where they are needed. It is great! No more messing with wet yucky filters. Neighbors up the street have a gorgeous garden but they do not harvest what they grow before it goes to seed or just rots. It drives me nuts since it is near the road and I can see rows of lettuce that has not been touched and will go to seed any day now and heaps of yellow squash just sitting there ready to rot. I honestly do not understand and they do this year after year. I’m sure herbs will grow! Herbs are the closest thing to weeds that I grow–pretty hardy most of the time. Good luck with your patio garden. I’ll bet you end up enjoying it immensely. Oh my. You were not exaggerating about the weeds, not that I doubted you of course. They were pretty sobering. There were a LOT! But, right now, most of the garden is under pretty good control. Here’s hoping it stays that way. There is still that huge patch of weeds behind the blackberries…..